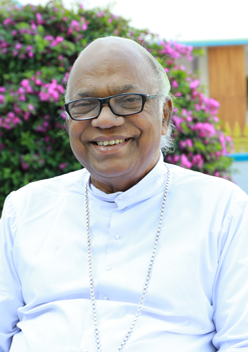 Bishop Mathew Anikuzhikattil, the first and emeritus bishop of the eparchy of Idukki, was born on 23 September 1942, at Kuruvanal, near Pala, as the third child of Kunjukutty and Aleykutty (Luka and Elizabeth). When he was in the primary school his parents migrated from Kadaplamattom to Kunchithany in the High Ranges. He completed his primary education at Kunchithanny and Chithirapuram. On completing High School education at St. Antonys High School, Mutholy in 1961, he joined the St. Josephs Minor Seminary Kothamangalam. Having completed philosophical and theological formation in the St. Thomas Apostolic Seminary, Vadavathoor, Kottayam, he was ordained priest on 15 March 1971 by Bishop Mar Mathew Pothanamuzhi at Holy Family church, Kunchithany, his home parish. Fr. Mathew was appointed assistant parish priest of St. Georges Cathedral Kothamangalam. After two years of service at Cathedral he was appointed parish priest of St. Josephs church, Josgiri where he served for seven years. He was instrumental in building the new parish church. In 1980 Fr. Mathew was transferred to St. Thomas church, Churuly, where he served only 56 days. Thereafter he was appointed parish priest of Nithya Sahaya Matha Church, Ezhukumvayal where he started the groundwork for the construction of the parish church with the wholehearted co-operation of the faithful. However, after one year, he was appointed as the director of Jeevajyothi, the diocesan pastoral center at Muvattupuzha, and as the manager of Mar Mathews press. In the meantime for two months he served as the Vicar-in-charge of St. Sebastians church, Neyyassery. He was also in charge of the Diocesan Family Apostolate and the period of his service was especially notable by a variety of family renewal programmes. In 1985 Fr. Mathew proceeded to the Catholic University of Leuven for higher studies in theology. He completed his studies successfully with a doctorate in Liturgical Theology. In 1989, on his return from Leuven Fr. Mathew was appointed Vicar-in -charge of St. Sebastians church, Pottankad, and thereafter served as the parish priest of St. Michaels church, Randar for a short period. In 1990 May he was appointed Chancellor and Secretary to the diocese, and visiting professor at Paurastya Vidyapitham Vadavathoor. Ten years of service as Chancellor gave him vast experience in the diocesan administration. He was appointed Rector of St. Josephs minor seminary, Kothamangalam in 2000 and he was Vicar in-charge of Thrikkariyoor. Besides he served as the member of the Presbyteral Council, Diocesan Council, Diocesan Catechetical Committee, Diocesan Construction Committee, Diocesan Liturgical Committee and Diocesan Discernment Team in different periods. When the Eparchy of Idukki was erected by His Holiness Pope John Paul II by separating eight Foranes of the diocese of Kothamangalam on 15-01-2003, Rev. Dr. Mathew Anikuzhikattil was appointed as the first bishop. On March 2, 2003 he was consecrated bishop and the diocese was inaugurated. In May 2003 he made the first ad limina visit to Rome. He served as the Chairman of the K.C.B.C Commission for Family, Laity and Women, Member of K.C.B.C. SC/ST/BC Commission, and Member of the Syro-Malabar Synodal Commission for St. Joseph's Pontifical Seminary Mangalapuzha, On 23rd September 2017 upon completing 75 years of age, Mar Mathew Anikuzhikattil submitted his resignation from the office of the Bishop of the Eparchy of Idukki to the Synod of the Syro Malabar Church.